ALL in JUST 30 DAYS! Consider this shocking fact: Most of us forget 80% of what we learn! Most of us forget that 80% in just a matter of a FEW DAYS! If you learned a foreign language in high school or college, can you still speak it fluently today? When you leave a party, do you remember many (or any) of the names of the people to whom you were introduced? Do you ever forget birthdays, anniversaries, meetings? Or forget where you put your keys or glasses, or where you parked your car? Of course - ALL of us could gain from an improved memory and improved ability to learn. But what if you could take the giant leap from learning and remembering, to having the innate ability to MASTER it. You'll be able to master the subjects, professions, and disciplines that you are interested in. Mastery is the ability to act by blending skills with knowledge. Interestingly, people who have achieved mastery in one area typically master another quickly because they have learned how to learn. The more aspects of life you master, the more of an expert learner you become. In fact, learning and mastery create new neural connections in your brain that get you out of mental ruts, increase your performance, and enhance your ability to effectively deal with complex problems. Of course it's not easy to master any subject. Just think about how many times you've tried to get better at something by reading a book, attending a lecture, or listening to a program. Right after you take the information in, you think you'll remember it forever. But within a few days, you've forgotten almost everything. When you attempt to learn and then master things using traditional methods - such as by highlighting books, rereading material, or relistening to recordings - it can take years of dogged determination to achieve your goal. But here's the good news: There is a much, much easier, more enjoyable, and infinitely more effective way. And it takes only 30 DAYS! Slow brain aging, become an "expert learner,"
In recent years, leading neurobiologists and education experts at BrainX™, a company that offers accelerated-learning programs, created the first Online Learning Mastery System™. This award-winning technology is currently used by corporate training programs, education programs, and sales training programs to help employees and students quickly master course material. And now Nightingale-Conant has taken a major step forward by forming a partnership with BrainX™ to bring this breakthrough technology to you. 30 Days to a More Powerful Brain: The BrainX™ Learning Mastery System™ combines high-energy audio sessions with an online reinforcement system to teach you how to amplify your mental power. The program is based on a wide body of scientific research on how the brain works, how it ages, and what we can do to not only stop mental decline, but even increase our mental abilities. The BrainX™ Online Learning Mastery System reinforces the brain-building and accelerated learning strategies you'll learn in the audio sessions so they get locked into your long-term memory, where you can put them to use in your life. You'll know exactly how to recoup any lost brain function, as well as how to expand the power of your mind. And when it's all said and done, you'll be able to master the things you want to be better at. Whether it's starting a second career, learning another language, or never forgetting a name, you'll be able to do it in a lot less time than you think. The program's authors and presenters are Bruce Lewolt, Founder and CEO of BrainX™, and Dr. Tony Alessandra, President of Online Assessments and Chairman of the Board at BrainX™. Both are leaders in brain education and practical applications of breakthrough scientific discoveries. As advocates for lifelong learning, Bruce and Tony have produced an online learning system that is the first to apply cutting-edge research in how the brain achieves mastery of information. What makes this system so effective is that it overcomes the two biggest obstacles to learning: gaps in initial understanding and, of course, forgetting. First, the system identifies and remediates gaps in understanding on an individual basis. (I'll tell you how it accomplishes this in just a moment.) Otherwise, you would not be able to use the information, and mastery of the knowledge would be impossible. Then it solves the problem of forgetting by forcing your brain to actively recall the information you learned in several different days. Active recall does not mean just reviewing or rereading the information. Instead, you have to recall the information in response to a question. Step 1: Make sure the learner has a good understanding of the material. Step 2: Accelerate consolidation by fully reactivating memories on several different days. Step 3: Let time pass - test learning 10-30 days after learning. This new technology totally alters your potential for learning and mastery by (1) transforming your ability to quickly recall information and (2) changing your time frame for realizing your objectives. Meet your Personal Digital Tutor! The Learning Mastery Formula cannot operate in a vacuum. Proper sequencing and context are critical components to making sure that you understand the information that is being presented to you. Otherwise you won't be able to master the information. The only way for that to happen is if the system forms a personal connection with you in the same way a good teacher or tutor does. 30 Days to a More Powerful Brain: The BrainX™ Learning Mastery System provides your own Digital Tutor that personalizes the program content and experience for you! Your Personal Digital Tutor, which is customized to your learning style, molds each lesson to your specific needs and lets you move at the pace that is best for you. If you need help in answering a question, the tutor will give you hints or even provide a complete explanation to help you remember the information. In addition, the tutor will keep track of what you have mastered and what information you still need to review. And it will work with you until you have mastered all the information in the program. Research shows that working with your Personal Digital Tutor and answering the questions on a few different days (your tutor will recommend a schedule that is appropriate for your specific needs) is the most effective and efficient way to lock the information you learn from the audio sessions into your long-term memory. Not to mention it's an incredibly fun way to learn! Once you master the information in the program, learning becomes a walk in the park. You are able to quickly learn and master any subject, field, or discipline - to improve any area of your life. I realize it's very difficult to imagine how this awesome technology works, especially the Digital Tutor, which is at the heart of the online reinforcement system. 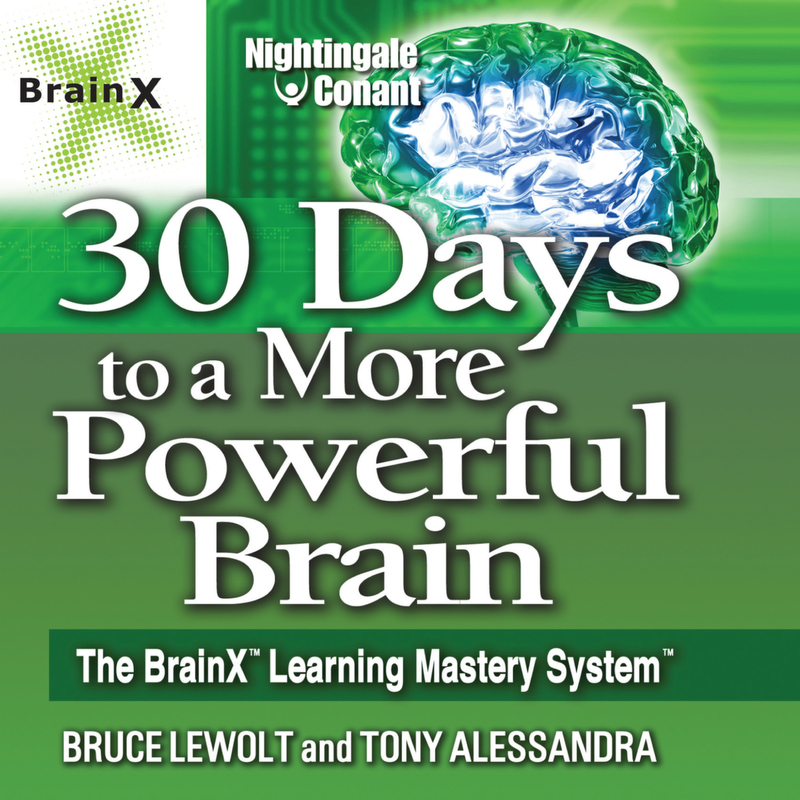 So, I invite you to experience 30 Days to a More Powerful Brain: The BrainX™ Learning Mastery System. Listen to each session as many times as you wish. Jump online to work - and play - with your Personal Digital Tutor. And then test yourself to see what is locked into your long-term memory - and what you still need to work on. As you work to improve your mind, just watch, and you will find examples of progress all around you. In fact, the power of this program is that it is mind-expanding on so many levels. I'm confident that it will be life-changing when you put its lessons to use. As a whole, this program does much more than improve your brainpower. It contributes to a more important goal - creating a high level of mental energy in you that will express itself through excellence, joyous self-discovery, and the opportunity to live in a way that continues to surprise you. BONUS FEATURE! - 30 Days to a More Powerful Brain includes a bonus CD containing an interview with Dr. Gilbert Rishton, Director and Chief Scientist of the Channel Islands Alzheimer's Institute. Dr. Rishton is passionate about finding ways to inhibit Alzheimer's disease. This eye-opening interview describes the physical process the brain goes through as it ages and what the latest research shows you can do to slow down and reverse the mental decline that is caused by this aging process. The BrainX™ digital learning system was named “Best Information Management Educational Resource” in the Media & Methods Awards Portfolio competition! I'm ready to reap the benefits of a better brain! I want to be in a position to receive a promotion, increase my salary, and become an expert in practically any subject by greatly expanding my memory and amplifying my mental power in just 30 days.